When I was young, like most children, I had the occasional confidence wobble. My parents were very patient and kind about these wobbles. They’d use a particular phrase to reassure me that I reckon most 1970s parents trotted out with intense regularity. “Just be yourself”, they said. I have to be honest: as a seven year old, this phrase was utterly meaningless to me. I just couldn’t get my head around how I could do anything other than just be myself! The idea that people could pull on another personality and wear it just for school, or tap dancing lessons was completely alien. One thing I certainly don’t approve of is pulling on an outfit that isn’t ‘yourself’. Since I figured out my personal style, I literally never have to do that, unless it’s enforced fancy dress. But, I can easily conjure up that feeling of having clothes on that don’t suit your personal style or character, and don’t feel authentic. This can show up in various ways. Someone whose natural style is girlie and feminine might feel too ‘manly’ in a classic suit. While, another woman, whose true style is classic or dramatic might feel too ‘scruffy’ in loose linen trousers and a flowing top. So what can you do when you simply HAVE to wear something that doesn’t suit your style for work, as a uniform, or simply because it’s what expected of you at a particular time or place? Maybe you work in a very ‘corporate’ office, and have to wear a suit or (very topical) heels every day, but just don’t feel comfortable in formal wear. Or, it could be when you’ve got an event to go to, such as a wedding with a formal dress code. When I worked with Jo Martin, from One of Many, we identified that her main problem was that her true style is very soft and informal (the ‘natural’ style) and yet, her main occupation involved lots of presenting from a stage, where the expectation is that you will dress up very smartly. The opposite of this is if you are a dramatic or classic dresser, and as soon as you have to rough it a bit, you struggle to feel comfortable. If you have ever wondered about packing hair straighteners for a camping trip, you are in this category, my friend. So, what’s the solution? Spend a day in discomfort, or is there a work around? I suggest that you should stay secure in your true style and aim to smarten it up or casual it down in a way that isn’t too far removed from where you are most ‘yourself’. If you feel your best dressed down in casual clothes and need to smarten up for an occasion, chose classic shapes in softer fabrics, namely, a jersey dress with stretch, a patterned scarf, or even smart jeans with a blazer in a soft fabric. If you feel your best with hair and make-up done and dramatic, styled clothes, tone down the hair and make-up. Bring your style personality into your practical clothes by using colour, unusual textures and print. Time and time again I get confirmation from my clients that there is a strong link between how you feel you look and how you behave. So many women report back to me a total change in confidence once they get the clothes on the outside to match how they feel on the inside. And this is SO important, because, if you don’t feel like you in your clothes, you won’t be able to relax and enjoy yourself, and that’s what life is all about. As you may have found out last week, I finally have all the details of my 2017 Masterclass pieced together! 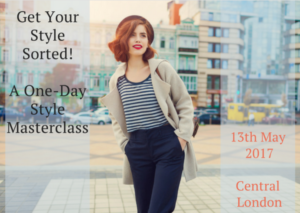 If what I’ve written today, or in any of my other blog posts resonates with you and you KNOW now is the time to get your style sorted out for once and for all, you need to join us! The earlybird rate is still available, but I have a limited number of seats in the room, so if you want to come, get your ticket now!